PORTLAND, Ore. (AP) — An Oregon man who was rescued after five days stuck in deep snow with his dog is deeply grateful to his rescuers and embarrassed to have caused so much trouble, his aunt told The Associated Press on Monday. 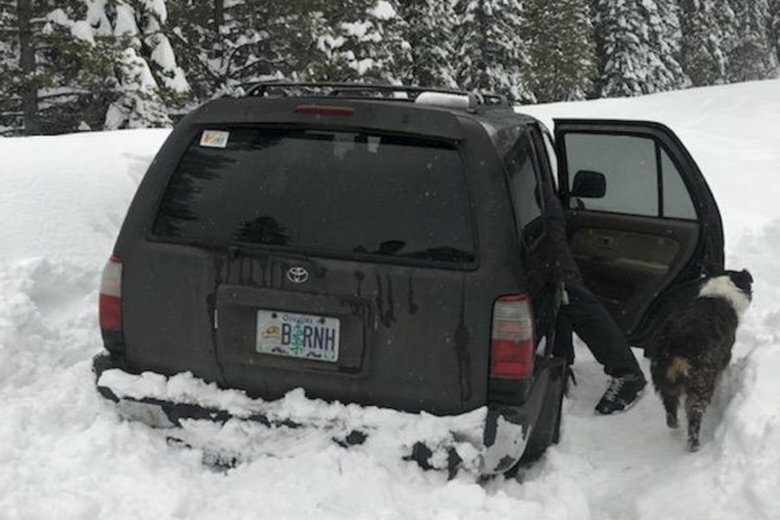 Jeremy Taylor’s 4-wheel-drive vehicle got stuck Feb. 24 in snow on a U.S. Forest Service road as he headed to do some off-road driving in the wilderness outside the central Oregon city of Bend. As night fell, Taylor, 36, decided to sleep in his car with his Australian shepherd, Ally, and hike out the next day, his aunt, Denise Tremaine said in a telephone interview with The Associated Press. Taylor fashioned some snowshoes from pieces of the roof rack he uses for his kayak and started off on Feb. 25. But after a mile (1.6 kilometers), Taylor had to turn around because the dog was sinking in the deep snow and could not continue. Taylor carried Ally back to the car and the two hunkered down there, sharing a sleeping bag to keep warm. Taylor had a full tank of gas and was able to blast the heat briefly when it got unbearably cold and ate a few packets of taco sauce he had with him, she said. He and the dog drank melted ice, but she said she does not think Taylor fed the dog hot sauce. Eventually, Tremaine said, heavy snow from more snowstorms made it impossible for Taylor to open his vehicle’s door. At one point, he saw an airplane overhead and raced to push the snow off the car’s roof so rescuers might see him, but it did not work. He did not have a cellphone with him or any emergency supplies, she added. “He didn’t take the provisions he should have. I gave him a little of that talk and I’m just glad he’s alive, because I think there was a point there when he didn’t think he was going to make it,” she said. What Taylor did not know is that by Feb. 27, his friends had realized that the self-employed building contractor was missing. He had not shown up to work and no one had heard from him, so friends reported him missing. Search and rescue crews combed the forests outside Bend by snowmobile, airplane and drone and as word spread on social media, friends and acquaintances searched on their own using snowmobiles. On Friday afternoon, a snowmobiler found Taylor and he and his dog were brought out of the woods on a snowcat, a type of snow tractor, and they were reunited with family and friends. He returned home to find his roof was damaged from heavy snow and his water pipes were frozen, Tremaine said. On Monday, he headed back to work and ignored interview requests from TV bookers and messages to talk with public relations representatives for Taco Bell, among others, she said. He did not respond to a Facebook message from the AP seeking comment. “Jeremy is very, very quiet and he doesn’t want the limelight. He is just incredibly sorry and slightly embarrassed that so many people were out looking for him,” Tremaine said. Over the years, many people have gotten stranded on Oregon’s snowbound rural roads — and the outcome isn’t always so good. In 2000, a 29-year-old man was discovered by snowmobilers clinging to life in his car, which was completely buried by snow in the Deschutes National Forest near Bend. Thomas Wade Truett had been stuck for 16 days in five feet (1.5 meters) of snow, surviving on orange juice and almond M&Ms. He had written a goodbye letter to his parents. Six years later, a family of four headed home to San Francisco from a Thanksgiving trip to Seattle and Portland missed a turn and wound up stranded for a week on a logging road after trying to take a short cut over a mountain range. The husband, James Kim, tried to hike for help and died after walking 20 miles (32 kilometers) in freezing temperatures. His wife and two young daughters were found alive in the car after a nine-day ordeal. A Montana man starved to death in 1994 after getting stuck on the same road in winter.